This is a visual illusion. When you look at it, there appears to be a great deal of motion as things rotate in various directions. But there's no actual motion; this isn't an animated display and you can verify this by fixating the centre or touching your computer screen - no motion. I just fooled your visual system. But Andrew, you say, you've been talking all this time about how great perception is! It's direct, functional, reflects experience, and lawful: if perception is all these things, how can it be fooled so easily by some pixels? Direct realism surely cannot handle this: perception is flawed, and readily shown not to correspond to the way things really are. Clearly this James Gibson is a mad man and we can go back to 'knowing' that perception is clearly mediated by pretty good but fallible representations. In Chapter 2, Heft examines the life and work of James student EB Holt, who links Gibson to James by being the student of the latter and the graduate advisor of the former. Heft discusses Holt's work and frames the discussion to show how the key ideas from radical empiricism come through to feature so heavily in Gibson's psychology. A lot of the fundamentals should now be familiar: Holt follows James in denying any type of dualism and in considering cognition to be a completely natural phenomenon. Holt is a realist, considers relations to be real and where the action is, and (eventually) considers all psychological phenomena to be the result of dynamic, time extended interactions between an active organism and a structured environment. 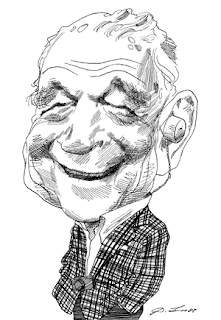 It's no coincidence that Gibson described himself as a 'Holtian philosophical behaviourist'! I mentioned yesterday that James' theory about pure experience being all there is, and relations being legitimate objects for perception does at one level sound crazy. Surely physics is where it's at - if you aren't talking about a physical variable, how can you be talking about anything real? 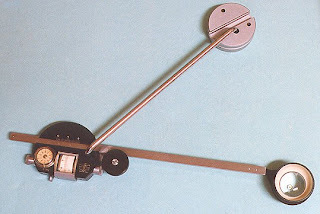 Ecological theorists have one good example to hand, courtesy of a 1977 paper by Sverker Runeson, that might help: the polar planimeter (pictured). This is a device that measures area directly, rather than measuring the 'simpler' physical unit length and then performing the necessary computation. Runeson uses this device as an example of a 'smart' mechanism, and proposes that perception might entail such mechanisms. This book got heavy, fast! 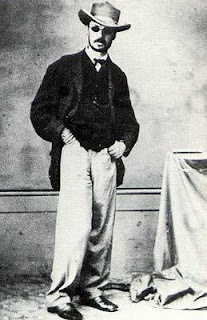 The first full chapter discusses the metaphysics of William James (pictured in his younger, cooler days) and how it is the philosophical groundwork for Gibson. Assuming Heft's analysis of James is right, this is precisely what it is. I won't review all the detailed argument because there is a lot of material in this chapter. What I will do is summarise the key points. 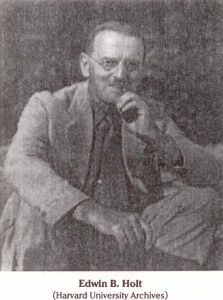 The goal of James' metaphysics (theory of the way the universe is composed) is to replace the dualism he and others like Dewey knew was (and still is) lurking at the heart of psychology. Metaphysical dualism is the assumption that there are two kinds of stuff in the universe - for Descartes it was soul and world, for psychology it was mind and body. Dualism is a major problem, if true, because of one important point - if there are indeed two types of thing in the universe, how can something of one type (e.g. a mental state) come to have knowledge about something of another type (e.g. an event in the world?). It is, in fact, impossible by definition, and for this reason any line of reasoning that entails a dualism is generally frowned upon in philosophy. In which Gibson defines everything. See here and here for a refresher. “The world of physical reality does not consist of meaningful things. The world of ecological reality, as I have been trying to describe it, does. If what we perceived were the entities of physics and mathematics, meanings would have to be imposed on them. But if what we perceive are the entities of environmental science their meanings can be discovered” (p. 33). In a previous post, I summarised Dietrich & Markman’s definition of representations and ideas about how representations get their content. While there are many flavours of representation, D&M subscribe to the discrete computational (DC) variety. To summarise the previous post: According to D&M, representations are internal mediating states that govern behaviour. Representations have relations to both the external and internal (i.e., other representations) environment. They acquire content in two ways. The first way is through correspondence, where some internal state connects to some external state. The second is through functional relations with other representations. Representations are transformed via computations. The main purpose of this post is to summarise D&M's main arguments in favour of discrete representations so that I can refer to these in other posts. I make several comments about the quality of these arguments, but this is in no way meant to be a systematic response to their paper. Welcome to the first instalment of the Gibson (1979) reading group. I’m reading this for the first time, so I’m going to take things pretty slowly. If anyone is interested in following along, let me just say that Gibson is surprisingly readable. In this introductory chapter Gibson establishes the importance of the environment to the study of perception. It’s a brief chapter, but I think it’s important enough to leave it on its own. This is the first post on the readings I'm doing at the moment. I'm going to be focusing on Heft (2001) while Sabrina is going to work on Gibson (1979). Heft is a psychologist, and the goal of this book is to 'examine the historical and theoretical foundations' of Gibson. This is an excellent idea: as Heft points out, a lot of modern psychologists reject Gibson as being 'out there' and 'from out of the blue' when in actual fact his basic approach is firmly rooted in the work of William James and Edwin B Holt, Gibson's graduate advisor.